Not a “fruity drink” kind of person and looking for a classic? Obviously I do a lot of girlie “martinis” on this blog (that’s cuz I like ’em!) but I thought it was about time I posted what I typically make for the man in the house, a Classic Martini. My husband prefers Bombay Sapphire Gin but feel free to substitute your favorite gin, or vodka if you’re not a gin drinker. While this might not be the exact way to make a classic martini, it’s the way I make them around here. The ratio of gin to vermouth seems to vary from recipe to recipe. Then there’s the debate over shaken or stirred. In the end, it all comes down to how YOU like it. This is my husband’s all time favorite drink and the way he likes them so that’s what I’m sharing with you today. My husband likes his martinis “up and dirty”, shaken well, with 3 olives, preferably stuffed with anchovies. Truth be told, he’d take 6 olives if nobody was looking. It’s like an appetizer in the glass for him! Today I got all fancy and made my own anchovy stuffed olives. Usually I buy a jar of them but sometimes they’re hard to find and stuffing your own are really much better tasting (according to my husband). I prefer my olives stuffed with blue cheese so I stuffed a few with a really great blue cheese. They’re so good, and I think better than what you can get from a jar. For me, I’m not much of a gin drinker, so if I’m having a straight up martini it has to be with a good vodka…my favorites at the moment being Bootlegger 21, Ketel One and Hangar One. Hummm? What’s with the number one that I like so much? Again, use your favorite because that’s what you’ll be tasting in this drink! 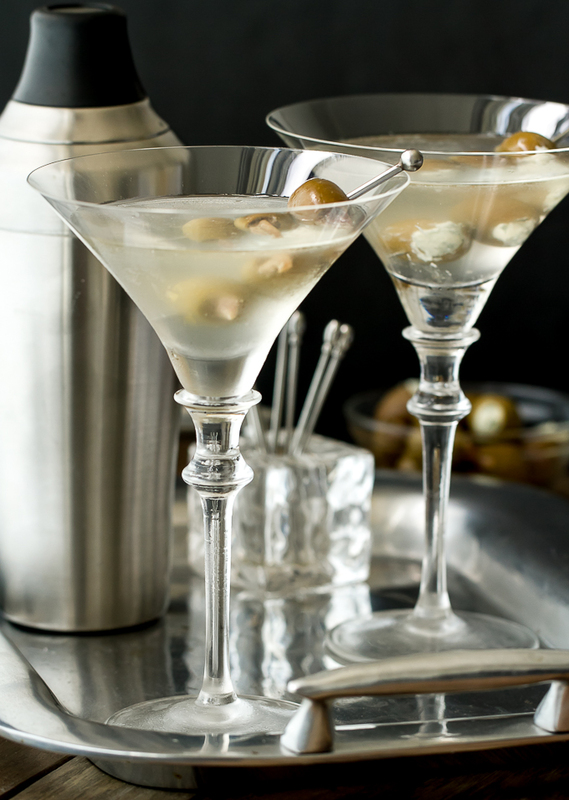 So whether you like your Classic Martini with gin or vodka, shaken or stirred, try stuffing your own olives and make your martinis extra special tonight! Tell me, are you a classic martini type of person or a “fruity” martini person? 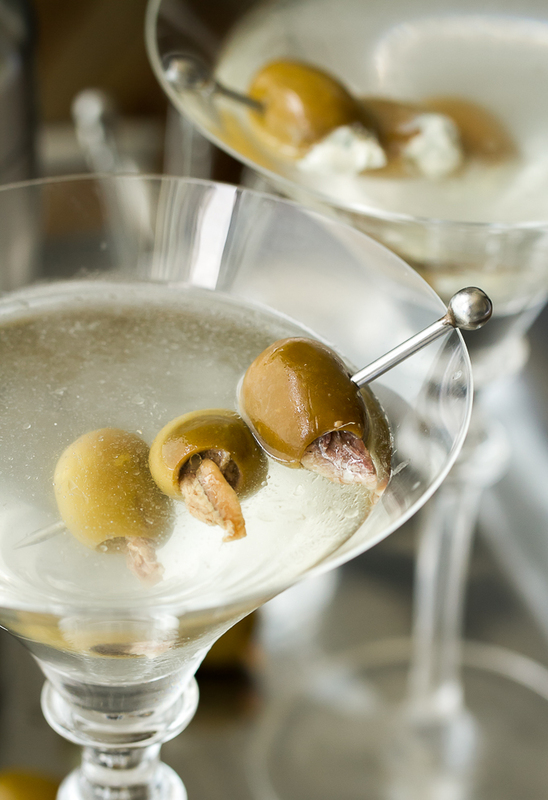 A classic martini served "up and dirty", shaken, not stirred, and garnished with home stuffed anchovy or blue cheese olives. Use your favorite gin or vodka for this cocktail. In shaker filled half full with ice, combine gin, vermouth and olive brine. Shake well and strain into chilled martini glass. 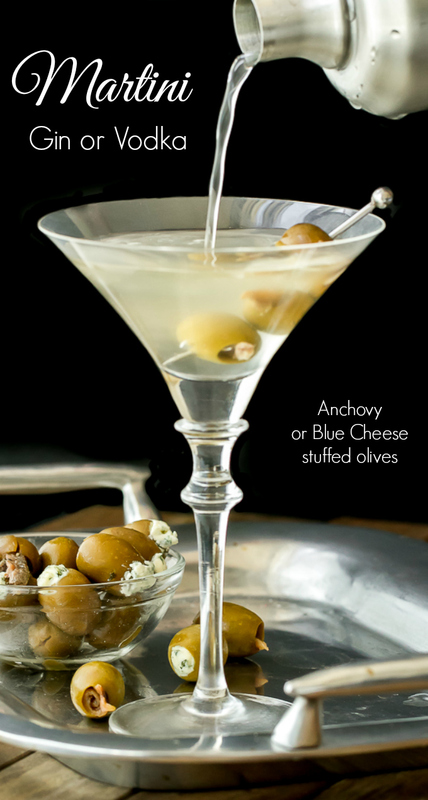 *You can purchase anchovy and blue cheese stuffed olives, or make your own. Purchase large pitted green olives, a can of flat anchovy fillets, and your favorite blue cheese and stuff the olives! I’m a fruity girl myself. The pictures are beautiful Judy. I can picture your husband sitting in a paneled library drinking this. Me too Linda! Actually, Mark most likely is sitting on the patio watching the boats go by and, occasionally, smoking a cigar! Beautifully sophisticated! I must say I prefer fruity drinks, but this certainly looks elegant! You had me at “martini,” Judy. Pretty much any kind will do, but I, too, like a classic martini, too. And I love that you include plenty of vermouth in there. For a long time, I thought it was cool to order a martini very dry, but for me, the vermouth really adds to the drink. Cheers to you! Have just been introduced to your site because of Martini recipe. The “Martini” you prescribe – Ugh! How awful. evening before catching the train home. There, he usually had one more. one of those expensive English-make, which are also far more expensive. Use a regular cocktail glass if available, but any glass will do. Use a good DRY Vermouth. Martini & Rossi just right. Put a splash into your glass. Swirl around glass until it is coated. Add enough DRY GIN until close to rim. Drink it ! How about the other ‘half’? Never call it, “A second”. Ultimate way to have a martini is dry, stirred down, with a dry vermouth, lemon twist, touch of orange bitter for depth. A shaken martini is called a Vesper (James Bond Martini), it’s a diluted version of a martini due to the shake, typically vodka, gin & Lillet. The guy who wrote James Bond didn’t drink & so the term shaken, not stirred was all for the saying than the drink. Thanks for your input! I still believe the ultimate way to enjoy a martini is any way you personally enjoy it. Cheers! where did you get those martini glasses?! they are beautiful! Thank you, I love them too! I’m not sure where they came from, they were a gift… I’ve had them for years! Never mind what the others say. Sounds brilliant to me. Cheers!